Amy Oakes received her B.A. in political science from Davidson College and her Ph.D. in political science from the Ohio State University. 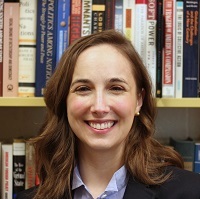 Her research interests include the domestic causes of war and nuclear nonproliferation. Her work has appeared in Security Studies, Politics & Gender, International Journal, International Studies Quarterly, and Foreign Policy. Her book, Diversionary War, examines whether governments provoke international crises in response to domestic unrest and was published by Stanford University Press in the fall of 2012. In 2009-2010, she was a research fellow at the John F. Kennedy School of Government at Harvard University and in 2012 she received W&M's Alumni Fellowship Award. She currently directs W&M's International Relations program.